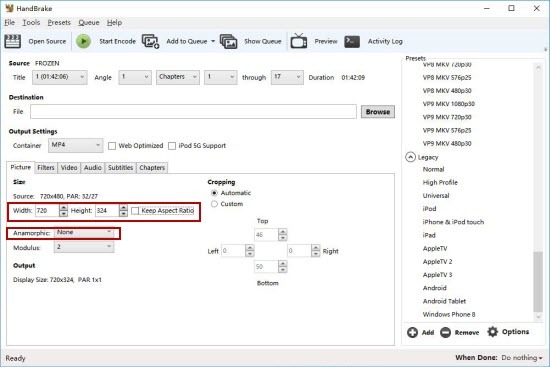 How to Solve Handbrake Rip DVD VOB to MP4 Aspect Ratio Distorted Issue? How to Rip/Convert DVD VOB to MP4 File Using HandBrake without Aspect Ratio Distorted Issue? "I am not masterful at using Handbrake so I don't know much about it yet. I've ripped 720x480 VOBs using DVD Decrypter and I'm now trying to convert these huge VOBs into more size-friendly MP4s. However, when I check "Keep Aspect Ratio", it locks the dimensions to 720x304." Three solutions to this problem - Handbrake rips DVD VOB to MP4 with distorted aspect ratio - are offered below. * Rip DVD VOB files in VIDEO_TS folder to MP4 with original aspect ratio. * Rip home-made & commercial DVDs encrypted by CSS, region code, RCE, UOP, Sony ArccOS, Disney DRM, etc. * Rip DVD disc/VIDEO_TS folder/ISO to MP4, AVI, WMV, MOV, AVCHD, FLV, etc. Change your settings from "Anamorphic: None" to "Anamorphic: Strict". Then the output video will strictly follow with the original file size. If the output resolution still has problem, the trouble-maker may be DVD Decrypter. When encoding from DVD or a VIDEO_TS folder, Handbrake would spot the mismatch (2.37:1 stream vs. 1.78:1 container) and would defer to the container's setting. If you use "Anamorphic: None", disable "Keep Aspect Ratio" (since the reported PAR is wrong) and manually set the frame size to 720x480. Whenever you feel curious and want to try Handbrake alternative, then Google "best Handbrake alternative", and WinX DVD Ripper Platinum will be the answer. This versatile DVD ripping software is available to rip VOB files in DVD VIDEO_TS folder to high-quality MP4 AVI and other popular formats (MOV, WMV, FLV, 3GP etc.) without distorting aspect ratio. Additionally, it also allows you to change aspect ratio and other parameters freely according to you needs and edit videos by trimming, cropping, etc. In the following, let's learn how to use this best HandBrake alternative - WinX DVD Ripper Platinum to convert DVD VOB to MP4 while remaining original aspect ratio without distorting issue. Above all, we should download and install this HandBrake alternative on our computer. Step 1. Launch WinX DVD Ripper Platinum and next click + Folder button to import VIDEO_TS folder which stores DVD VOB files into this program. Step 2. After Output Profile window pops up, select MP4 Video (Codec: h264+aac, Resolution: keep origin) under General Profiles category as output with original aspect ratio. Step 3. Click RUN button to start converting DVD VOB files to MP4. Tip: If necessary, you can click Edit button to crop image for manually aspect ratio setting. Otherwise, you can directly go to setting panel to modify aspect ratio.